Trying to impress your customers with your stylish, funky new website for your Hotel? Enter HotelMotel. Based on the flexible Foundation grid, HotelMotel performs perfectly to all monitor and mobile sizes. 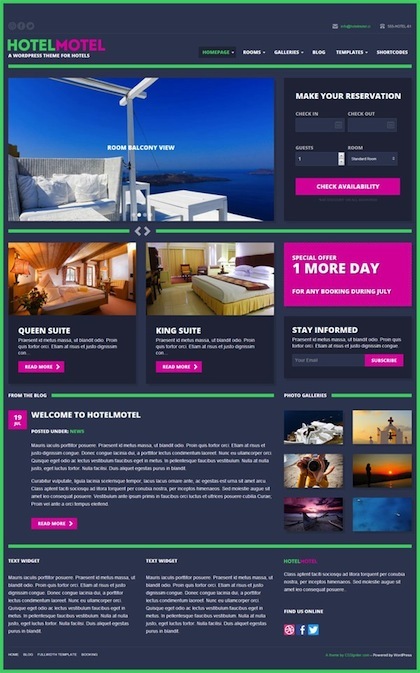 HotelMotel allows you to create unlimited homepage templates with the powerful shortcode system. Six amazing predefined color themes to easily customize your hotel site to your hotel theme colors. Integrate your favorite booking system or let your visitor get in touch with the online booking form. Other features of HotelMotel include online scrolling featured images, shortcodes, google maps, gallery, rooms amenities, rooms features, social media icons, social media integrated, seo optimized and more.